The band are reaching the end of their US tour. As the sun beats across the cobblestones of Front Square and a historic maple tree dominates campus discussions, over 2,000 miles away a group of Trinity students are making a name for the College for completely different reasons. The Trinitones escapade to America, a 10-date tour, was an idea that had lingered on the horizon following the success of their “Land Down Under” tour in Australia last year. Speaking to The University Times, the Director of the Trinitones, Andy Keenan, noted how the idea was thrown around casually for months until, with the help of New York native Zach Miller-Frankel, the throw-away comments and light-hearted suggestions were transformed into a reality. This transformation came not only by virtue of natives and ambition, but also thanks to the group’s astounding success in the past year. This, Keenan observed, was harnessed by the popularity of their “Budapest” video, posted before their performance at Trinity Ball. Since then, Keenan said, Trinitones’s fan base has grown significantly larger, “with over 50,000 likes on Facebook now, we’re the most popular acapella group in the world”. Describing the experience as “surreal”, Keenan and his fellow members are continually surprised by just how far-reaching their music and their influence has become. “There’s certainly something bizarre about busking in rural Vermont and being recognised by the audience”, he said. Perhaps there is something bizarre in having an American audience, but the group are still enjoying the ever-reliable support of the Irish abroad. Indeed, even in rural Vermont, the Trinitones are made feel right at home, with their music giving the audience what Keenan called “a fierce pride in their heritage”. This pride has ensured “that when we’ve performed for Irish communities here, there’s a deeper emotional connection”, he said. When quizzed on the group’s appeal beyond Front Arch and across the Atlantic sea, Keenan said: “It’s very clear from our performances that we’re ultimately just a group of close friends enjoying ourselves.” The group engages with audiences at a more emotive and personal level, drawing in an impressive fan base and making for an incredible summer experience in the US. Looking back on their American experience, Keenan recalled a number of moving and stand-out moments. From days spent performing in front of the Mayor of Montreal and the Lord Mayor of Dublin at the city’s famine commemoration, to those more quiet experiences in Gettysburg where the busy singers got a chance to engage with the culture and history of America, it was “an incredibly sobering and powerful experience” Keenan said. Their two biggest performances are yet to come. In fact, the group are set to perform at the request of the Kennedy family for the 50th anniversary of Bobby Kennedy’s assassination, and on June 13th they will be performing the national anthem at Yankee Stadium before a game – a crowd of 55,000 is expected to be in the audience. With Australian and American tours under their belt, an album in the works and their palpable sense of enthusiasm and ambition, the group are certainly qualified to claim their places on the stage. Their first album is expected next year, marking yet another major milestone for the group. 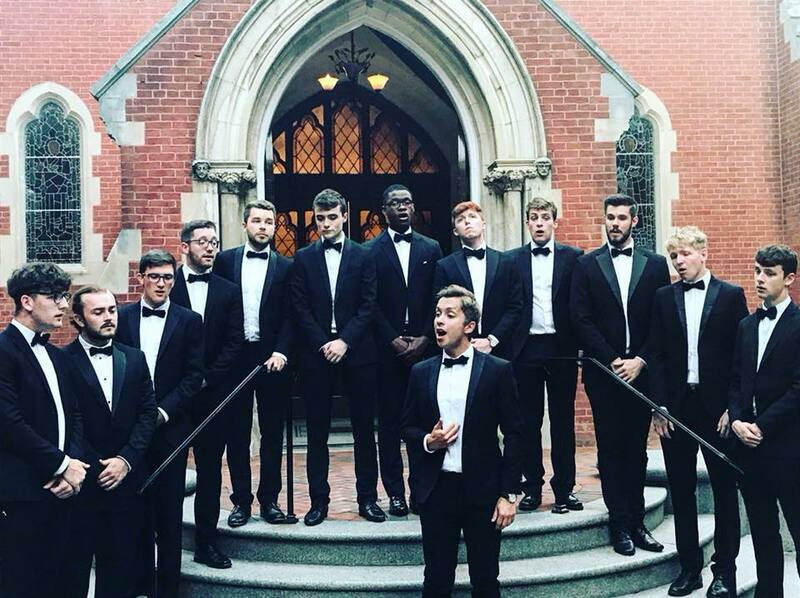 With such exciting plans ahead, it is clear that Trinity’s all-male acapella group are intent on sustaining the momentum they have gained in recent months. The group have only gone from strength to strength, not only in the past year but, as Keenan eagerly reminded me, since the success of their cover of “Teenage Dirtbag” 2012. “We’ve been standing on the shoulders of giants”, he said. Earlier Trinitones, such as Ben Jacob, Daragh Kneeshaw, Robert Somerville and Neil Dunne, have directed the singers and helped to steer the group toward their considerable success and popularity. The group’s Yankee stadium performance will mark the close of what has certainly been a hectic, thrilling and fruitful year for the Trinitones, but it points towards an even busier and exciting year ahead.